TODAY'S GAME: Iowa and Oklahoma City meet for Game 3 of the five-game set following a double-header yesterday. Iowa already has more victories than the entire month of April in 2018 as the I-Cubs went 5-17. A win would also put the I-Cubs four games over .500 for the first time since 2015. GOODBYE GIAMBRONE: With a game-tying home run in the second game of yesterday's doubleheader, Trent Giambrone is tied for third in the PCL with seven extra-base hits. 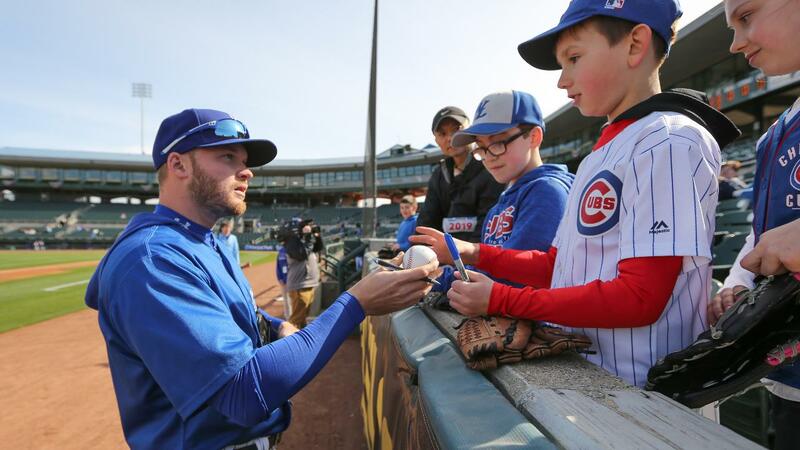 The first-year Triple-A player has hit for extra bases in six-of-eight games this season, the best stretch of his professional career, while hitting in four different spots in the I-Cubs lineup. WALK IT OFF: Dixon Machado hit a walk-off homer for Iowa on Thursday. It was the first walk-off bomb for an I-Cub since John Andreoli broke up Angel Ventrua's perfect game for Colorado Springs with a walk-off homer in the seventh inning of game one of a double-header on Aug. 17, 2017 at Principal Park. FINDING THE GAPS: Johnny Field clubbed his league-leading third triple of the season Thursday. Prior to 2019, the outfielder hadn't punched a triple since June 17, 2017 and has not had more than three triples in a season since collecting six between Double-A Montgomery and Triple-A Durham in 2016. MACHADO MASHES: I-Cubs shortstop Dixon Machado is having a hot start to 2019. His .643 on-base percentage is tops in the PCL, while his .500 batting average ranks second in the league. He is one of three PCL players to rank in the top-10 in batting average, OBP and slugging percentage. AGAINST OKLAHOMA CITY: Iowa went 5-11 against Oklahoma City in 2018 and 4-4 at Principal Park. In four games against the Dodgers last season, Dillon Maples struck out eight without surrendering a single hit in four appearances. He added perfect frame of work to his line last night. REA RETURNS: Iowa native Colin Rea was lights out in his first game at Principal Park. Rea spun a quality start in his second game of the season, going 6.0 innings and allowing one unearned run with five punchouts. It was his first quality start since June 23, 2018 against Sacramento, his only outing of 6.0+ innings last season. Rea recorded nine quality starts in Triple-A in 2015 and seven in the big leagues in 2016. A large factor in his success has been his ability to pitch out of trouble, posting a dominant 1.93 ERA while holding opponents to .153 batting average with runners in scoring position. FACES IN THE CROWD: The Dodgers' roster features former I-Cubs RHP Justin Grimm and LHP Rob Zastryzny. Both were on 2016 playoff rosters for the World Series Champion Chicago Cubs. Grimm appeared in 20 games across four seasons with Iowa (2013, 15-17) and Zastryzny played in 62 games over three seasons (2016-18). For the Dodgers, INF Jake Peter -- a Mason City native -- returns to his home state to face the I-Cubs. SHORT HOPS: Iowa has scored first in a game just three times this season, going 2-1 in those contests...The I-Cubs' 3.79 team ERA ranks second in the PCL, trailing only San Antonio (3.58)...Iowa has walked a PCL-low 26 times while punching out 89 times.